This was a strange day. It started at 1:00 AM when the pager went off for a first responder call. It is like climbing out of a cave on a greasy rope… trying to achieve enough consciousness to determine where the address is, where my socks are, etc etc. I made it out the door with Alice’s help with all the gear I needed, and was the first first responder there. I can’t go into details, but I can tell you I didn’t get home until after 4:00, and lay awake for an hour or more after I made it back to bed. It is hard to wind down after events like that one. Wind down I finally did, though, and we fortunately were able to sleep in because of Labor Day. I’m glad I had the luxury of a snooze this afternoon. I woke up feeling pretty refreshed and ready for the next phase, which included a short walk with the dog, and then getting things ready to head back into town for the technical rehearsal of “Once Upon a Mattress.” The plan was to have dinner at Peterson’s outdoor restaurant on the way up to Calumet. This is a family fishing business that markets the fish they catch by selling it from their little trailer parked on US 41 near the hospital turnoff. The food is very good, and we feel good about supporting a family operation. Unfortunately for us, but good for them, they apparently decided to take Labor Day off, because the place was closed. So we punted again and stopped at the Burger King in Calumet for another leisurely meal, and then on to the theater. What can you say about tech rehearsals? It is the first time the actors work with the lights they’ll be using for the show, the sound, props, drops, etc. It is the first time all these separate layers are slid over one another, and there are bound to be some rough edges. We were all responsible for a few, but the cumulative effect, in my opinion, was to show us this thing is doable with some more work, and the outcome will be yet another good show. 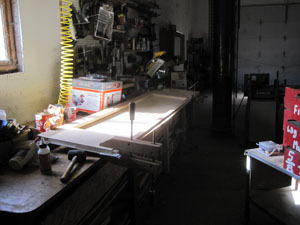 My job again this year is in the fly loft. Another trip home from town followed, with another enthusiastic reunion with our dog, and a 1 mile walk with the backpack. We both needed it, and we were even treated to a warm fall rain on the tail end of the hike. These strange days show us we can adapt if we need to, and that we are not yet stuck in a rut. Stay tuned for more stories about the show, which you won’t want to miss. Today was a rototiller day. I finally got a calm enough day to seed the outside garden with its winter coat of annual rye grass. Then I set the depth bar as high as possible to whip up the top inch or so of the garden to cover the seeds with some loose soil. As I was moving across the garden, I stopped and observed an unusual site. All the potato plants had already been tilled into the earth, but one leaf of a plant was sticking out of the dirt, and there were about 8 adult potato bugs on it. It seems that when I harvested and tilled in the foliage, I missed some adults, and they were still hungry before their winter sleep, so they congregated on the one bit of greenery left to have one last snack before winter. I quickly shut off the tiller and got the can of used motor oil, and tossed them all in. It got me to thinking that this might be a good way to interrupt the cycle of potato bugs. Get rid of all the plants except a few succulent ones, and scatter them around where the plants used to be. The next day most of the remaining potato bugs should be there feasting, and in their concentrated form, they are easy to get rid of. I’d be interested to hear if others have tried this and if it works for you. 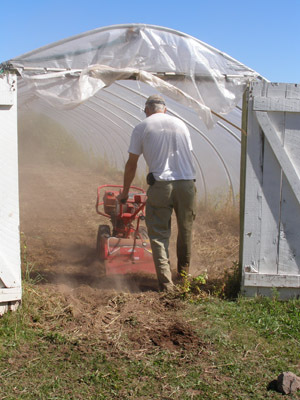 Then I tackled the tilling of the greenhouse garden. It hasn’t seen much watering in the past several weeks, and the soil was hard in there. And it was a bit dusty. You get used to it after a while I guess, but I probably should have, as Alice suggested, worn a dust mask in there. I got things looking pretty good though, and then spread out two large bags of peat moss to the top of the soil. 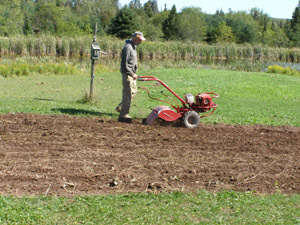 One more good tilling to mix things up, and then I’ll seed it with annual rye, water it, and put it to bed for the winter. I also got the antenna for my Engenius phone installed today. I still have wiring to do inside, but the hardest part by far is now completed. I decided to take down the ladder and scaffolding since I was done with the outside part. The ladder came down according to plan. The scaffolding took a bit of a swing when it went over the lip of the roof, and punctured the screen on one of the windows in the entryway. So, that is another project to work on. I finished the book I was reading today also. It is called, “Burning Daylight” by Jack London. I heartily recommend it for anyone looking for their place on the planet. As is common with Mr. London’s writing, it is a good yarn with some interesting human insights, and a pretty good moral too. Today was a big day on the homestead. After a couple of days of rain and generally weather not conducive to working outside, I got the potatoes harvested. We had six rows and did pretty well. There were a lot of big ones this year. I can already tell you they taste good, because we had some for supper tonight. 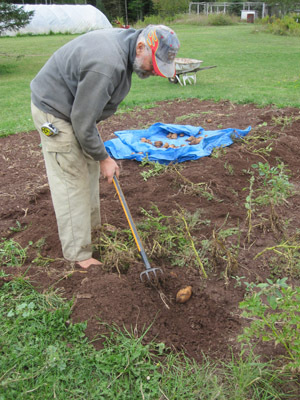 As careful as I am, I still manage to spear several nice potatoes with my digger, so those are set aside for use as soon as possible. We had a nice big pot of mashed potatoes for supper tonight, and these were some mighty fine potatoes, I can tell you. I emptied the compost drum today and hauled it all into the outside garden. I also had part of the previous load on the ground near the drum, so moved that into the garden too. My impetus for this activity was the 2 5 gallon buckets of food garbage were full, so a new load of compost needed to be started. Before I could start it, I had to empty the old load. 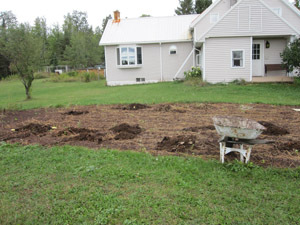 After the potatoes were gone and the compost moved, I then rototilled the outside garden. What a satisfying event. The soil was rich and deep and full of organic material. We’ve worked hard to build up this soil over the years, and it is nice to see the progress. The next chore will be to seed the entire garden with annual rye, so the garden will have a nice green blanket for the winter. I also started on the antenna project. I have a special cordless phone that is supposed to have a range long enough that I can get a signal anywhere on our property. I chose it because our cell service is spotty to non-existent out here. Well, the new phone did not live up to its hype. I contacted the company, and they suggested I purchase an outside antenna for the phone. It came this week, and I’ve been thinking about how to get it installed. The best place for the antenna is on the roof peak on the west side of the house. 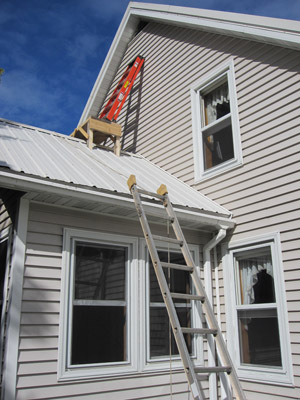 Unfortunately, there is an entryway there, making it impossible to lean a ladder up to the work site. I came up with a scheme to build a scaffold to sit across the peak of the entryway roof that was big enough to stand a step ladder on. Today I hauled it up to the roof and placed the ladder on it. It worked very well. I spent all day drilling one hole to get the cable from the attic through the soffit and in position to plug it into the antenna. Hopefully tomorrow I can install the antenna and patch the hole I made in the soffit. It has been a strange week for weather. It was either Tuesday or Wednesday that it was so hot I didn’t even put a t shirt on all day. 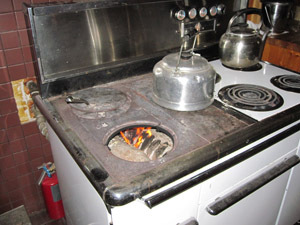 Two days later it got so cold at night that I started the first kitchen stove fire of the season. It has been relatively cool ever since. For tonight’s backpack hike I needed the hood of my sweatshirt for the first part of the walk. I’m glad I was able to get my walk in tonight. I’ve been a bit headachey for weeks now, and was bad enough last night that I didn’t even do my hike. I slept long and well last night, and this morning felt like this batch had finally run its course. Today I got a bit more done on the left wing of our Avion truck camper. I am starting to glue the thing together now, which needs to be done carefully. This wing holds the camper in the air when it is on its 3 jacks, so if needs to be done properly. I carefully cut the support pieces and biscuit-joined both of them, clamped them, and set it all aside to dry over night. First thing today I finished tallying all the fire department stuff, and printed, stuffed, and stamped all the rest of the thank-yous. I loaded it all up on my bike and rode to Pelkie to make the deposit and mail the letters. The temperature for riding was just about perfect. It is a 10 mile round trip and I felt great. The only real trouble I have is with my hands resting on the handlebars. They tend to get a bit sore from all the pressure, so I just adjust my grip now and then and make it just fine. I emptied the dehydrator, and we now have about 3/4 of a gallon jar filled with dried tomatoes. Last year we started using them routinely in our salads in place of the anemic ones you can buy in the produce section. We realized they are way better that way, so try to dry enough each year so we can make it without having to buy tomatoes during the off season. After lunch, I was hungry for some dessert, so I decided to try one I wanted to use on the Grand Canyon backpacking trip. I had already bought a small packet of Betty Crocker Blueberry Muffin mix. To bake it, I took my largest nesting backpacking pot and put a small trivet inside it. I then greased the inside of the next sized pot, mixed up the batter, and added it to the greased pot. This pot is put inside the other pot on top of the trivet, and most of the space between the two pots is filled with water. This whole thing is covered, and a tight cover of aluminum foil is attached over the top of everything. The entire contraption goes on the stove and is brought to a boil. The water boils between the pots heating up the batter in the inner pot much like an oven. It boiled on low for about 18 minutes, and what came out was pretty good. I made a small batch of frosting, but didn’t wait for it to cool before I put it on. No matter, because I ate the whole thing in one sitting. If it works as well in the canyon as it did today, we will be a couple of spoiled hikers. You are currently browsing the Rural Life in the UP of Michigan blog archives for September, 2010.